How do teachers captivate their students? Here, in a Chalkbeat feature, How I Teach, we ask great educators how they approach their jobs. You can see other pieces in this series here. 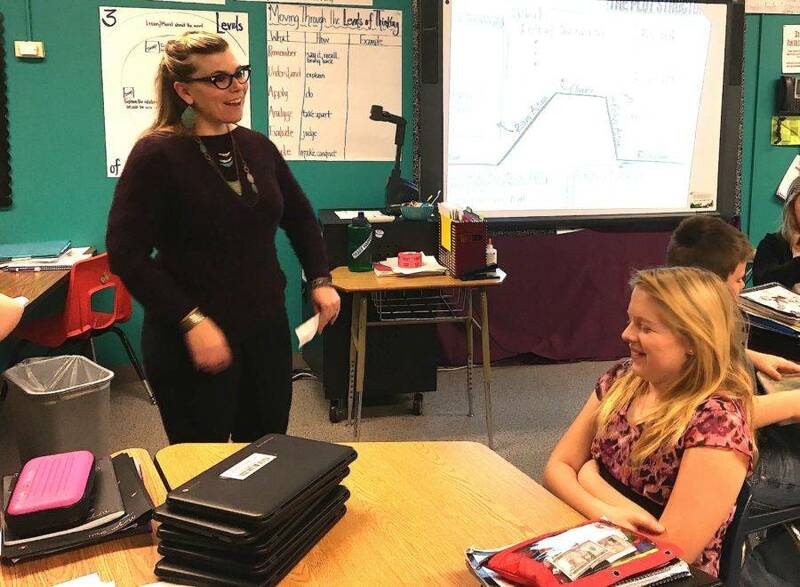 Collaborating with students is important to Jessica Moore, a language arts teacher at South Valley Middle School in northern Colorado’s Weld County RE-1 district. It’s why she uses Google docs to help teach writing. It’s also why she starts the year with blank classroom walls. Moore is one of 15 teachers who were selected for the inaugural Colorado Teaching Policy Fellowship operated by the national nonprofit Teach Plus. The nine-month program aims to involve teacher leaders in education policy discussions, including how the state responds to the Every Student Succeeds Act, the new federal education law. I work best early in the morning, so I generally arrive at school between 6:30 a.m. and 7 a.m., always with my coffee in-hand! I spend my time before the bell rings either creating lessons, refining lessons that I have previously taught or those in progress, and preparing instructional materials for my students. In order to make learning interactive, I often use manipulatives, such as word or evidence cards. Many mornings, I am furiously cutting away on the paper cutter in order to have these materials ready to go for kids before class starts. I have seven large, circular tables in my room where students work, as well as a table in the back that I use for small group intervention and individual conferencing with students. I always start the year with my walls entirely blank. I believe that anything that goes up on my walls needs to be created collaboratively with my students. The posters are created together through instruction and discussion, which ensures that they are more than just colorful decorations. I have a teacher station at the front of my room, which is really just my document camera on top of my computer cart, but I use this area for direct instruction where I can project any text that we are working with on the board for all of my students to see. Although it is not fancy, the use of Google Docs has been a powerful tool in my work with students on their writing. Whenever we start a new writing assignment, students share their doc with me. As they are writing, I check in with them in real time and provide comments and suggestions. They love the text message feel and respond with questions, comments or ideas for changes. Not only does this give me a record of our conversations, but also helps me to guide them in the writing process in a more timely and authentic way. As a language arts teacher, one of the core components of my lesson planning is text selection. College- and career-ready standards prioritize the use of richly layered, complex text for all students. I have found that locating quality, engaging text is paramount to my ability to design thought-provoking, text-dependent questions and tasks that guide students to think critically and carefully about the text. Complex text also lends itself so well to teaching the nine other reading standards because there is depth to the material on the page. Once I have picked my text and aligned it with the standards, I take into consideration how I will support struggling readers to access the material that they might not otherwise be able to read on their own. I have found that using manipulatives, such as cutting apart the text to draw their attention to an important passage, or giving word cards to help them see patterns in author’s word choice, can be helpful as well as strategies like framed paragraphs to help students write more sophisticated responses. I also think about how I can meet the needs of my gifted students, which may include incorporating additional texts or research. The best lessons are ones where the students are clearly and intentionally asking and answering questions that not only address the content of the lesson, but also connect to other content areas as well. I love when we have to pull ourselves away from our lesson because class is over! Never miss a story. Like us on Facebook. Generally speaking, students will understand at least some part of the material, so it is my job to figure out where the breakdown happened. I usually will sit down with a student one-on-one and start back at the beginning of the lesson. Sometimes, this includes having them tell me what the directions were. Sometimes I ask them to tell me about what they just read, while other times, I have them walk me through their thinking about a particular question. Out of these conversations, it usually becomes clear quickly what the misconception or gap in thinking was and I can work directly with the student to make adjustments and corrections. Middle school is an interesting age because there can be literally a million reasons why a student has lost engagement. But I have started to notice that when one has lost focus, others are likely to follow. I usually respond in a couple of ways. First, I try proximity. I might stand near the student, or ask a question to get a sense of where his or her mind is. Sometimes this works, and other times it’s an indicator that I may need to change things up for everyone. Recently, I have found that taking a minute or two to break and talk about life has been surprisingly powerful! Sometimes they just want to tell me something that has happened, or share a silly joke, but I try to be flexible and willing to meet them where they are because the relationship aspect of teaching is so powerful. Also, when I am willing to share in their world for a few minutes each day, I can ask them to share in mine (the learning) for the other 50-plus minutes and they are far more willing. The most important thing that I have learned about engagement though is that relevancy is key — if they connect to the material, they will work to learn it. Phone calls, text messages, emails, Friday Folders and the classroom webpage. In writing, for example, I don’t wait until the final product is turned into grade it. Instead, I give regular feedback to my students and watch to see how they integrate my comments and suggestions into what they are doing. If I asked them to write a paper and then just graded what they turned in, I would likely have a lot of Fs. But I am interested in the learning process as much as the final product. I also really love to use rubrics, and find that developing the rubric together as a class as part of the instructional process gives my student buy-in and an awareness of the expectations that we collectively have for our work. I have always been really interested in the criminal justice system. Recently, I started reading the book “Chasing the Scream,” which is a fascinating look at the War on Drugs. I haven’t been able to put it down! It is giving me a lot to think about in terms of the future of our country and gives me even more conviction about the importance and role of education in our country. My mother-in-law once told me: “They won’t always remember what you taught them, but they will always remember how you made them feel.” I think about this every single day (seriously!) I know that they might not all remember what assonance is, but I do hope they will remember that I honestly and truly cared about them as unique individuals.